I had a very busy and interesting week recently. 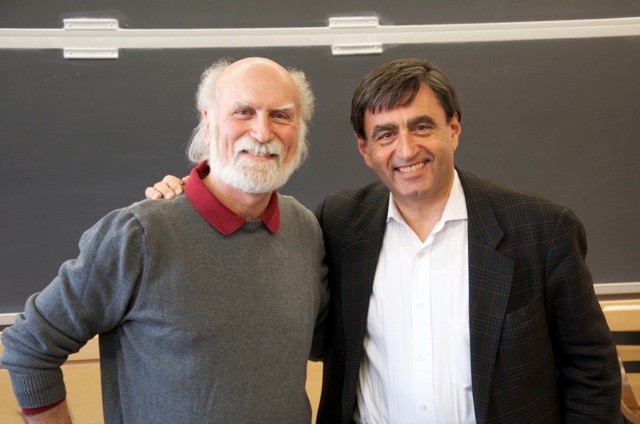 I spent a day with Harvard Physics professor Eric Mazur and his design and research team. I then took the train north where I spent the next day visiting math classes at Phillips Exeter Academy where the entire program is problem-based. Mazur, as many readers know, is the pioneer of using ‘clickers’ in large lecture classes to better engage students, tease out misconceptions, and use class to further in-depth understanding (not just content acquisition). Mazur has over a decade’s worth of solid data that makes crystal-clear the idea that less teaching plus more feedback – even in a 200-person lecture hall – gets better results than typical coverage and is a far better use of (limited) class time. He and his team have developed a very cool web-based feedback system that is in beta. (Read more about it here.) Students can not only give answers with text and drawings on computers, cellphones or other devices, the software can encourage students to re-group in certain ways if the current seating patterns are leading to wrong answers, or if the teacher wants people who gave different answers to group! You can learn more here. What was most impressive was to see students present their work without fear, even when they announced at the start in some cases that they hadn’t solved the problem but would present their start to it. Teachers were very deft about asking probing questions and encouraging student input – much like a good Socratic Seminar in English. The essence of the modern revolution in education, begun 60-70 years ago with the implications of Piaget’s and Bruner’s research, is to play out an ugly truth (ugly, that is, for naive teachers): students are not blank slates. They bring firm views and beliefs to the table that must be engaged if in-depth understanding is to occur. Why? Many of those conceptions are mistaken: much of modern disciplinary understanding is counter-intuitive to naïve learners. (You can find a great summary of research on misconceptions in science and math, for example, here and here). Thus taking the time to probe – whether in a class of 200 or around a table with 12 – is the essential instructional move of the successful teacher. It is not time lost but time gained: we won’t have to keep re-teaching and being frustrated by surprisingly poor results on tests of transfer. SOme of the problems are rather challenging. Are there solution books to these problem sets? If there are, the Exeter faculty were not letting me know or see any! You might want to write the Dept. Head and ask. My guess is no. (They run a great summer institute at Exeter each summer on math teaching. I spoke there last summer and had fantastic conversations; the exeter approach is addressed in break-outs). 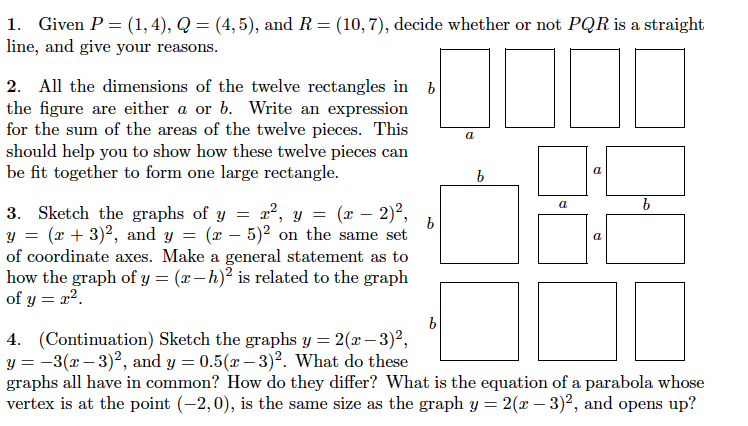 There are answer packets (not sure if there are full solutions?) but they are generally not distributed. I am really glad to hear that you firmly believe that the Harkness method, or any other discussion-based method for that matter, is a possibility in public school classrooms. It just so happens that I am beginning to write my Action Research proposal on doing just that. I am pursuing my M.Ed. from New England College in Henniker, NH, and I am an alum of Phillips Exeter. I found the classes to be humbling, challenging, and ultimately empowering. My Exeter education had a far greater impact on me than my undergraduate experience, and I use the lessons learned there every day in the real world. My idea is to develop a method of scaffolding appropriately for a middle school humanities classroom. As a sixth grade humanities teacher, I dabbled with running a Harkness conversation with various levels of success. Generally my success was directly related to the nature of the students involved. My goal with my Action Research is to look at how to bring a positive, effective discussion to everyone in a middle school class. Anyway, I just wanted to thank you for reinforcing my drive to look into this method of teaching. Also, interestingly enough, I swopped some emails with your daughter not long ago. I was looking at her Spider Web classes with interest. Then I ran across your blog and your thoughts here and just now put two and two together. BJ – Great! You’ll want to look at my daughter’s SPIDER resources (a link to googledocs on her blog) which provide lots of great resources for how to assess student performance as well as how to help students in the process. You will also want to check out our advice in the new book on Essential Questions that comes out next month. Good luck! And let me know if I can be of further help. Thanks, I really appreciate the advice. I will certainly be in touch if I need any help, although you have already been of help seeing as I am currently citing your work in my proposal- so thank you for that, too! I also heard recently that Exeter has partnered with few local high schools in NH to take the Harkness method to public schools. I have been very interested in the Exeter problem-based approach for some time now. Their emphasis on problem solving and collaboration is an area that is often underrepresented in schools. I sometimes wonder, however, if the problems appear both disconnected and abstract to students. Do the problems connect in some way other than just increasing difficulty? Does the method help students see how they are mathematical in their daily life? What are your thoughts? The problems connect to each other in all kinds of ways, and at least in my experience with these problem sets, that’s what a lot of the class discussion is for: unraveling those connections and exposing the relationships between the problems, finding the threads that run through them, and pulling out the bigger picture conclusions. I don’t think it helps students be more mathematical in their daily lives, except inasmuch as it helps them learn to solve problems when they come up. I think they need to do more problem posing, perhaps, to start making that transition? I have also visited Phillips-Exeter as part of my action research for my Masters program. What they do there is phenomenal, however they work with a very select subset of students. I teach high school math in a rural public school in NH and have a very different clientele for my students. Are there public schools using the Harkness model and a problem-solving curriculum with success? I would love more information on those schools so I can see how they have adapted Exeter’s work. You are not going to like my answer but I believe it is correct: that’s like saying because U of Kentucky is a D1 school that we should not try to coach basketball and run our team in emulation of them. I just never get this kind of fatalism, frankly. Backward design means designing backward from excellence. (That doesn’t mean having unreasonable expectations of results). Mortimer Adler said it well 30 years ago: the education for the best is the best education for all. Socratic seminar, problem based learning, etc, are EXACTLY what bored and unskilled students need to become provoked, motivated, and clearer on what the real world is about. School is currently in a weird alternate universe that doesn’t in any way prepare the average student for what the real world demands of repertoire, strategy, problem solving. So, I challenge you to think exactly the opposite way: how can what Exeter is doing be adapted to your setting? (I am not saying that what Exeter is doing is perfect, either; I see lots of ways in how they could be doing better; I am merely starting with your premise that what they do is worthy of emulation). I have led Soc. seminars in DC public schools and done PBL in Rochester NY public schools. It is not a demographic issue, anymore than good basketball coaching is. I actually agree with your response – my first thought when leaving Phillip-Exeter was “How can I make this work in my school?”. That’s why I was asking if you knew of public schools that have implemented this model, or a variation of it, and are having success. I would love to get in contact with them to discuss how the change was implemented, what challenges they faced, and how they are measuring its effectiveness. If my department/school plans on making a change like this, I would rather not be blind or be duplicating work that has already been done. Any advice you can offer on the actual implementation is greatly appreciated. We are using problem-based math and, to some extent, physics at St. Johnsbury Academy in Vermont. We have a hugely diverse student body, and I believe the key is to give ownership of the class to the students and let their discussions be largely self-moderated with coaching from the sideline. I often have a student “run the meeting” when work is presented on white boards. They seem to enjoy this, and they feel like they are in charge and are being treated like adults. Largely because they are. This is great, Tom. I think one weakness of the Exeter program is that teachers exert too much control (at least in my visit) in terms of process. Your last two sentences are key. Indeed, I am working on a blog post about this very issue – executive control and autonomy – because we are missing the boat on this issue completely. I teach at a large suburban high school in southwest Ohio, and this year I am using the Harkness method exclusively in my honors pre-calculus classes. Yes, it has taken a great deal of effort to put everything together, especially since our curriculum does not match exactly with Exeter’s. And, of course, there is the issue that I have 30 kids in each class instead of the average of 12 at Exeter. However, after three months, I am firmly convinced that this is the way to teach math, or more precisely, this is the way to learn math. The kids need to see math as the investigative science that it is, and that is exactly what teaching them through Harkness does. I am detailing my “adventure” this year at harknessforthirty.blogspot.com, if you are interested. Very cool! I visited and commented – and alerted others to it in my earlier post on Exeter. Hello, thanks for the informative blog, it’s a good read. I’m a bit scared to ask, but why does 3(x +5)/3 not reduce to x + 5? Is there subtlety in language involved here (perhaps there is some aspect of “reduction” that I’m not aware of), or is that just a typo? Obviously the two terms are equivalent. It’s strange, even though I’m a math teacher and have lots of successful experience with undergraduate math, I still feel intimidated at times. OOPS! It was a typo – it should have said 15 instead of 5 – I fixed it an hour ago insight of emails!! People do better when they know better. It’s nice to see the technology for accessing student understanding is improving rapidly.